“The sea king is angry.” Illustration by an unknown artist. 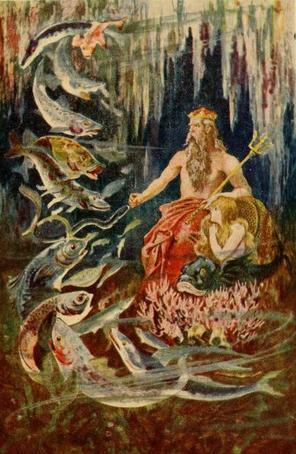 Published in Maoriland Fairy Tales by Edith Howes (1913), Ward Lock & Co, Limited. Read Maori legend, fairy tales and folk tales from New Zealand by the Polynesian inhabitants. These people are said to have arrived before 1300 CE and the oral tales they told are strong parts of their culture. Hartwell James was one author who collected Maroi tales, including The Magic Jawbone, the saga of the renowned demigod Maui, from birth to adulthood.